Summary and Definition: What is Area 51? It is a section of government land in the Nevada desert about 83 miles north of Las Vegas. It is surrounded by the Nevada Test Site and the Nellis Air Force Ranges that cover an area of approximately 3,026,700 acres. Inside Area 51 is a large Air Force base, located near the southern shore of salt flat called Groom Lake. The activities conducted in the region are top secret but covert technological experiments on aircraft and weapons systems are believed to take place inside Area 51. The airspace around the military base is completely off-limits and has been referred to on radio transmission frequencies as "Dreamland." The US government only publicly acknowledged the existence of Area 51 in August 2013 and the secrecy surrounding the base has given rise to numerous conspiracy theories that speculate on the possibilities of alien-government collusion or captured Alien spaceships, the bodies of Aliens. 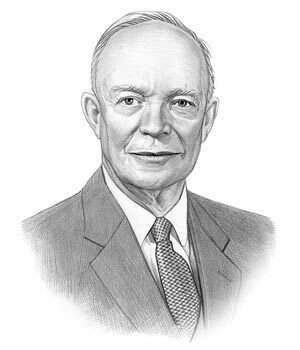 Dwight Eisenhower was the 34th American President who served in office from January 20, 1953 to January 20, 1961. One of the important events during his presidency was the increase in interest about Area 51. Fast, fun facts and Frequently Asked Questions (FAQ's) about Area 51. Where is Area 51? Area 51 is located in the southern portion of Nevada in the western United States, 83 miles (133 km) northwest of Las Vegas. 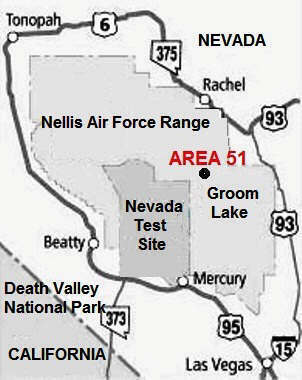 Area 51 is situated on the southern shore of Groom Lake. Area 51's coordinates are 37 degrees 14 minutes north latitude, 115 degrees 48 minutes west longitude. What is inside Area 51? High-level, covert technological experiments on aircraft and weapons systems are believed to take place inside Area 51. Why is it called Area 51? The number 51 refers to the grid reference of the secret military base on an old map of the Nevada Test Site. Area 51 and Aliens: Due to its secret nature, numerous conspiracy theories have connected Area 51 with Aliens. Many conspiracy theorists believe that Area 51 contains captured Alien spaceships and the bodies of Aliens. Others believe in alien-government collusion. What's the connection between the Roswell Incident and Area 51? The Roswell UFO Incident occured in New Mexico whereas Area 51 is in Nevada. The two have been connected via conspiracy theories that expound that that wreckage, or even alien bodies from the Roswell crash, are being held at the Area 51 US military base. The following fact sheet contains interesting information, history and facts on Area 51 for kids. Area 51 Facts - 1: Area 51 is the "operating location near Groom Lake", a military base that operates as Detachment 3 of the Air Force Flight Test Center. The Nevada Test and Training Range (NTTR) is a United States Air Force non-flying unit that provides command and control of top secret test and training programs. The Nellis Air Force Base supports operations at the Nevada Test and Training Range (NTTR), now known as the Nevada National Security Site. Area 51 Facts - 2: The Area 51 military base lies within the United States Air Force's vast Nevada Test and Training Range (NTTR) that covers approximately 3,026,700 acres and employs over 1,000 civilians and has over 8,000 military personnel. Area 51 Facts - 4: The purpose of the base is top secret but is it is believed to conduct High-level, covert technological experiments on new and innovative aircraft and weapons systems. The top secret projects, referred to as black projects, are approved by the by the US Air Force or other agencies such as the Central Intelligence Agency (CIA), who have confirmed that the site was first established as part of a wider Atomic Energy Commission test site. Area 51 Facts - 5: Black Projects are highly classified military or defense projects that are unacknowledged publicly by the US government and the military. The people who work on Black Projects typically include scientists, aerospace engineers, pilots and executives from the defense industry and NASA. Area 51 Facts - 6: The base at Groom Lake has traditionally been the US testing ground for the latest designs of secret aircraft aka "black" aircraft. Flight tests for the U-2 ultra-high altitude reconnaissance aircraft, YF-12 and SR-71 "Blackbird" interceptor aircraft, the Lockheed A-12 reconnaissance aircraft, F-117A "Nighthawk" stealth attack aircraft, spy planes, stealth helicopters and various unmanned aerial reconnaissance vehicles (UAVs) are all believed to have been conducted in the region. Area 51 Facts - 7: The restricted airspace is completely off-limits to any unauthorized aircraft or personnel. It is referred to as R-4808N, but popularly known by military pilots as "The Container" or "The Box". Area 51 Facts - 8: Area 51 prohibited to civilians and under military protection. The sinister "Use of Deadly Force Authorized" signs across the region add to the mystery surrounding the area and attract UFO enthusiasts to the area. They watch for UFO's (Unidentified Flying Objects) on public land at Mile Marker LN 29.5 on remote Nevada Highway 375 using the "Black Mailbox" (now a white mailbox), which is the only landmark on this stretch of the highway, as a meeting place. Area 51 Facts - 9: The very existence of Area 51 was only publicly acknowledged by the US government in August 2013. No descriptions of the facility have ever been released but the ground level of the base satellite images. However, Russian satellite photos leaked to US sources appear to show runways, aircraft hangar, control tower, guard posts, radar antennas, offices, housing facilities and "scoot and hide" buildings. The easy access design of the "scoot and hide" buildings or shelters enable any aircraft to quickly take cover when satellites passed overhead. Area 51 Facts - 10: Claims have been made that the visible buildings on the Area 51 base is only a small part of the actual facility and that the surface buildings rest on top of a massive underground facility has up to forty levels and is connected to different areas via underground tunnels and railways. Area 51 Facts - 11: The history of Area 51 began during WW2 when the United States Army Air Corps built two small runways on the salt flat at Groom Lake in the Nevada desert for training pilots who were testing the latest, top secret "black" aircraft. Area 51 Facts - 12: The runways fell into disuse after WW2, but the top secret remote location in Nevada became linked with the infamous event known as the Roswell UFO Incident. The contradictions surrounding the events at Roswell, New Mexico, gave rise to countless conspiracy theories that linked the Roswell UFO incident with the Area 51 US military base in the Nevada desert. The following fact sheet continues with facts about Area 51. Area 51 Facts - 13: Reports of Unidentified Flying Objects (UFO's), flying saucers and alien bodies attracted massive media attention and speculation. One of the most dominant of the theories was that the wreckage from the crash and according to some, the bodies of dead aliens, had been sent to Area 51. Area 51 Facts - 15: Lockheed, under the guidance of systems engineer Clarence (Kelly) Johnson, was considered one of the best-known American aircraft designers at the time and "Skunk Works" became the official alias for the Lockheed Advanced Development Projects. Area 51 Facts - 16: In April, 1955 the Groom Lake region was chosen by Kelly Johnson of Lockheed, test pilot Tony LeVier and CIA representative Osmond Ritland as a test site for the U-2 ultra-high altitude reconnaissance aircraft. Area 51 Facts - 17: Secrecy was critical to the project's success and the remote military base offered easy access by aircraft yet was out of the way of commercial flight paths. The site was also big enough to take a considerable number of personnel and afforded easy access to supplies via a major city. Area 51 Facts - 18: The CIA, the Atomic Energy Commission and Lockheed oversaw base operations and the initial construction works were completed by July 1955. The test flights for U-2's began and President Eisenhower signed an Executive Order 10633 restricting the airspace over Groom Lake. Area 51 Facts - 19: The top-secret Cold War era program known as Oxcart, aimed to develop a spy plane that would be undetectable in the air and could be used for information gathering missions in the USSR and the countries behind the Iron Curtain. Area 51 Facts - 20: In April 1957 a U-2 crashes during testing near Groom Lake, killing the pilot. Area 51 Facts - 21: In 1961 Colonel Robert J. Holbury, USAF, was named Commander of the Groom Lake base. Area 51 Facts - 22: On February 26, 1962 the Lockheed the Archangel 12 or A-12 reconnaissance aircraft was shipped via truck to Area 51 and the first flight test of the A-12 Blackbird was made on April 26, 1962 at Groom Lake. The A-12 could travel at speeds of more than 2,000mph and take clear pictures of objects on the ground from an altitude of 90,000 feet. Area 51 Facts - 23: On February 27, 1965 the first test of the D-21 Mach 3+ reconnaissance drone was launched from an A-12 Blackbird at Groom Lake. Area 51 Facts - 24: In November, 1977 the F-117A "Nighthawk" stealth attack aircraft was shipped to Area 51 for testing. Area 51 Facts - 26: On July 17, 1988 a soviet spy satellite took a photograph of Area 51 which was released in "Popular Science" magazine and other publications. Area 51 Facts - 27: Public interest in Area 51 increased due to the Robert "Bob" Lazar interview with investigative reporter George Knapp which was broadcast on Las Vegas TV station KLAS in May 1989. Bob Lazar, a researcher at Groom Lake testing facility stated he had encountered several flying saucers and had been hired to reverse engineer extraterrestrial craft at "S4" facility at Papoose Lake, just southwest of Area 51. Area 51 Facts - 28: Bob Lazar also claimed that he was given introductory briefings describing the historical involvement by extraterrestrial beings with planet Earth for the past 10,000 years. Lazar stated that the extraterrestrial beings, or aliens, allegedly originated from planets within the Zeta Reticuli star system. Area 51 Facts - 29: The Reticulum constellation is located at a distance of about 39 light-years (12 parsecs) from the Earth. According to Lazar the Aliens were referred to as Zeta Reticulans, but were popularly called "Greys". Area 51 Facts - 31: Descriptions of "Greys" are commonly included in alien abduction claims and "Greys" have been featured as aliens in the 1977 movie Close Encounters of the Third Kind, the 2011 film Paul and various television series such as the X-Files and Stargate SG-1. Area 51 Facts - 32: A depiction of a facility similar to descriptions of Area 51 was featured in the 1996 movie Independence Day complete with a government cover-up, an alien autopsy and a captured alien spaceship. The article on Area 51 provides detailed facts and a summary of one of the important events during his presidential term in office. The following Dwight Eisenhower video will give you additional important facts and dates about the political events experienced by the 34th American President whose presidency spanned from January 20, 1953 to January 20, 1961.